McClelland Laboratories provides detailed environmental characterization evaluations for potential of mine solids to mobilize constituents on contact with meteoric water and potential to produce or neutralize acid in natural weathering and oxidizing conditions to assist you in identifying potential environmental impacts which may require prevention during processing or mitigation on closure. McClelland Laboratories maintains current certification with the state of Nevada (NV-00933) for meteoric water mobility and humidity cell testing procedures. The purpose of the Meteoric Water Mobility Procedure (MWMP-ASTM E2242-13) is to evaluate the potential for dissolution and mobility of certain constituents from a mine rock sample by meteoric water. 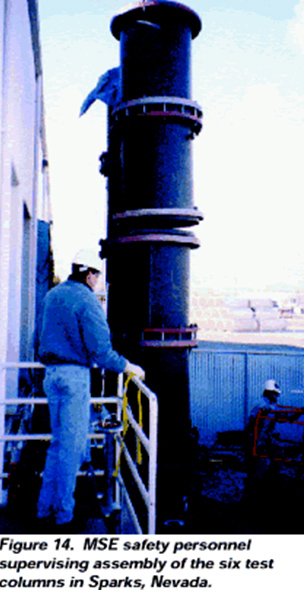 The procedure consists of a single-pass column leach over a 24 hour period using a mine rock sample. The resulting extract is then analyzed. Tailings samples and fine grained materials can be evaluated using a bottle roll procedure. The static acid/base accounting (ABA) test helps determine the potential of tailings/waste rock samples to generate acid and provides input parameters for kinetic tests. Testing provides sulfur speciation and acid neutralizing and generating potentials. A more dynamic and accurate method is to conduct humidity cell tests to determine the rate of acid generation. Humidity cell tests (ASTM D5744-12) are kinetic tests designed to model natural geologic processes occurring on site within a laboratory environment. Testing determines the rate of acid generation over time and any variation that occurs in the leach water. These tests can also be used to determine the geochemical kinetic parameters that are involved in the development of acid rock drainage for that particular rock sample. Once kinetic parameters are obtained from humidity cell testing through simulation and calibration, these parameters can be used in a geochemical model that simulates the natural environment in an actual rock pile. After data is generated on the geochemical character of the rock sample the next task is to evaluate the materials attenuation capacity. 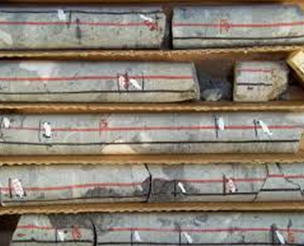 The geochemical reactions which are likely to occur when the solutions percolate through the soils or groundwater flows through the rock type can be simulated by sequential batch tests or column percolation tests. 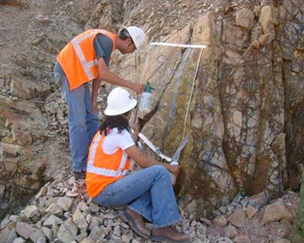 Sequential batch tests evaluate the attenuation properties on a small sample of rock material and obtain estimates of attenuation capacity. This procedure works quickly and is generally used when there are a number of samples to be tested. Column percolation testing better describes the attenuation process more accurately. These tests require several months to generate useful data for materials with low hydraulic conductivity. Once leaching is terminated in either a laboratory column leach test or in a commercial heap leach environment, it is time to neutralize the cyanide. This can be done either on a small laboratory scale column or on samples obtained from a commercially operating leach dump. On a laboratory leach test this testing can be done on column leach residues during the project development phase. Rinse-down tests are completed to neutralize the CN as part of the testing to determine the general leach parameters. Determining the neutralization parameters of a commercial heap leach is significantly more difficult, but just as effective. Representative samples of each 20ft leach interval is obtained by trenching and auger drilling the entire height of the leach dump. The testing is then performed on each interval, rinsing with site or barren solution to determine WAD cyanide neutralization, rate of decrease in rinse effluent pH, stabilization of any dissolved minerals and the dissolved gold recovery during recirculation rinsing. Once complete, the drain down procedure is conducted sequentially through the columns and the solutions are analyzed for all US EPA primary and secondary drinking water constituents. One of the biggest challenges in predicting water quality is estimating the long-term geochemical behavior of mined materials. Contaminant discharges from mine sites can take years to develop and are subject to climatic and seasonal variability in concentrations and flow. Properly conducted static tests can provide estimates of the total amount of acid generating and neutralizing material present, and short-term leach tests can be used to simulate the short-term interaction of water with weathered, mined materials. 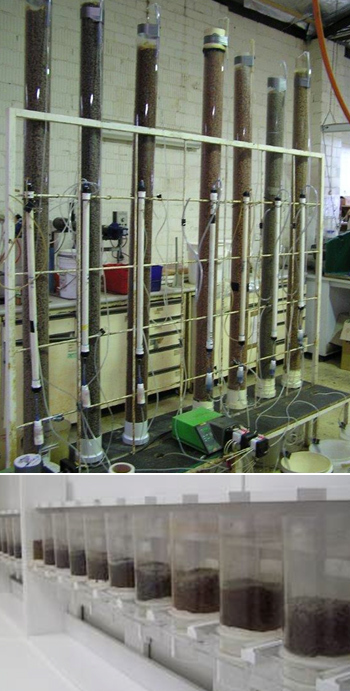 Column testing of soil samples utilizing site water can help to determine the suitability of potential infiltration pond sites for pit dewatering during mining. Tests can determine the capacity for constituent attenuation from pit water by infiltration pond site soils as well as the potential for constituent mobility from pond soils after contact with pit water to help characterize the water quality of effluent from infiltration pond soils. Chemical stability of the tailings is related to its acid rock drainage potential with waste characterization including static and kinetic prediction tests and whole rock lithogeochemistry. 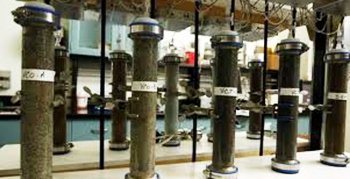 At McClelland Labs we characterize the contaminated solid and/or liquid matrices including soils, sediments, sludges, dusts and ash, and all types of aqueous effluents. We complete standard elemental analyses and physical characterization tests as well as Toxicity Characteristic Leaching Procedure (TCLP), cyanide reactivity, sulfide reactivity, ignitability, corrosivity, as well as heating value assessment.